Gabby Carr, relay teams shatter MVRHS records on Saturday. If you found yourself humming Springsteen’s “Glory Days” Saturday night at the MIT Zesiger Pool, you had good reason. 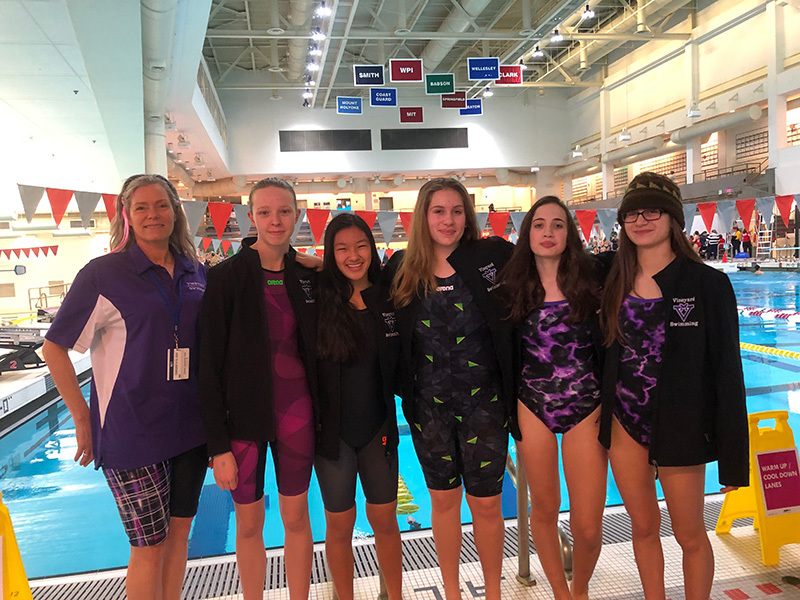 Five Vineyard swimmers set a bevy of personal records and state qualifying times at the girls’ South Sectional Championships before a roaring crowd and three dozen competing high school swim teams at the huge and flashy venue. They’ll move across the Charles River next week to swim in state competition at Boston University’s glossy pool in Boston in individual and relay competition. 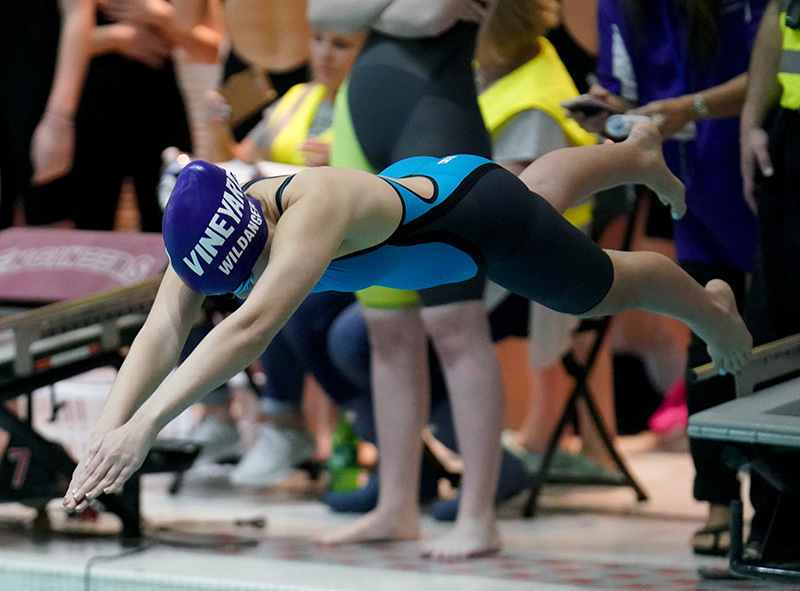 Martha’s Vineyard Regional High School (MVRHS) sophomore Gabby Carr was the sole MVRHS individual event qualifier, and she came up big, setting a new MVRHS and personal best time of 2:00.96 in the 200-yard freestyle. She finished ninth among 30 swimmers, the best ever finish at the sectionals or states by a Vineyarder. The 16 swimmers with the best times in the sectionals go to BU next week. 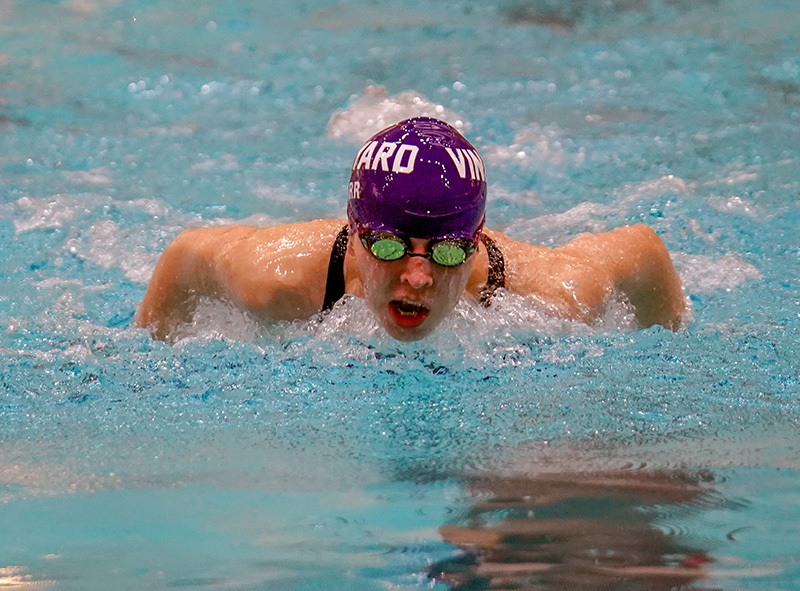 Carr had previously qualified to swim in five (count ’em — five) events at the sectionals. Alas, swimmers are limited to competition in two events. In her second event, the 100 butterfly, Carr lowered her school record by a second to finish in 1:03.11. That finish was good for a state-qualifying 16th place. But the Island drama was not over until the final events. The Vineyarders had qualified two relays for the sectionals, but none for the states, and these sectionals were the team’s last chance to qualify for BU. The 200 freestyle relay came through, dropping 3.49 seconds from its best time of the season to finish in a school record and states-qualifying time of 1:49.13. That time was good for 21st place (they were seeded 29th). 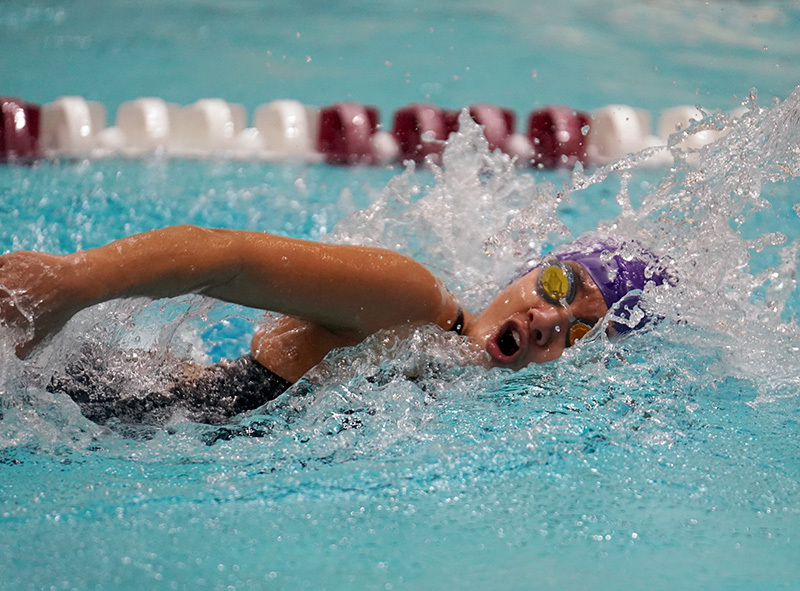 The swimmers were sophomore Yayla DeChiara (27.11), sophomore Eleanor Hyland (29.36), eighth grader Annabelle Brothers (26.93), and Carr (25.73). The last event was the 400 freestyle relay. The girls, seeded 22nd, were six seconds away from qualifying for the states. Again, the girls were up to the task, dropping over eight seconds to finish 14th with a state-qualifying time of 3:59.39. It was the best time any Vineyard swim relay had placed in the sectionals or states. All four swimmers swam personal bests, Brothers (1:00.21), DeChiara (57.40), senior Jasselle Wildanger (1:05.49), and Carr (56.29). The relay placed fifth at the conference championships, and was the third-highest conference finisher at the MIT meet.